Fireworks festivals in Summer are not normally the ‘done thing’ here in the UK, but in Osaka, Japan this is when they hold the world’s biggest and most popular firework festival. 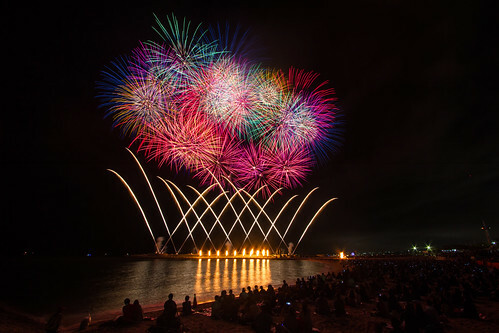 The main summer event is held in Osaka on the Yodogawa River and was started by volunteers in 1989 using handmade fireworks crafted especially for the event. This is a tradition that is still carried on today and brings not only a big display but a more one of a kind and dynamic firework display to be enjoyed by all. Osaka is known as the city of water due to the number of rivers passing through the area, the best known of which is the Yodogawa River. This was, therefore, the perfect venue for volunteers who decided to combine all their knowledge and expertise around pyrotechnics and so the firework festival was borne. Each of the display nights can last over 1 hour with combinations of different effects, synchronised to music. Tickets are available from around 2,500 Yen to get seats to the event also you can pay up to 8,000 Yen per person to get a chance of a prime viewing spot and this also includes a bento (a Japanese lunchbox) and chilled drinks. Whilst paying is an option, there are plenty of free seating and standing areas around the venue. However, it is recommended that due to the massive number of spectators attending the event that you get there early for your chance to grab a spot as at the height of the event, some 500,000 people are in attendance. Ikayaki – this is grilled squid on sticks normally washed down with a cup of beer. Kakigori – Shaved ice, perfect for cooling down on a hot summers day they come in many flavours like strawberry, melon, lemon etc. The dress code for the event normally consists of men and women dressed in their traditional summer dress of the Yukata. These are a popular choice of dress especially in the summer months as it is the perfect way to keep cool. The shells that the Japanese use in the displays can range in size from small to the world record-breaking like the Yonshakudama shells that are 1.2 meters in diameter and weigh several hundred kilograms. The most common shells used are called starmines, as these have a variety of burst patterns. Other unique fireworks include Niagara sparklers that are set under bridges to resemble the famous waterfalls and shaped shells that burst into familiar patterns such as hearts, smiley faces and cartoon characters. Fireworks normally begin after sunset and can last up to 2 hours long. They are broken down into shorter segments to make for better viewing. The best and longest display on the event is always the finale, making the night sky so bright that it resembles daylight due to the thousands of shells launched into the sky simultaneously. Due to the popularity of this event, travel agents around the World have now got in on the act and have started offering packages to the event that is all inclusive so that you can avoid the difficulty of crowded transport, seating and viewing areas etc.